-- In this engaging biography, readers will learn about the pioneer of Play-Doh, Joseph McVicker. Follow the story from McVickers' childhood, his education at Brown University, joining his father's company Kutol Products, and his reinvention of the company's Kutol Wall Cleaner as Play-Doh. Learn how Play-Doh is made, who came up with the name, the role of Captain Kangaroo in Play-Doh's success, and about other Play-Doh products. 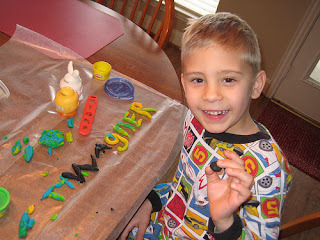 • Play-Doh Modeling Compound -- Plenty of non-toxic Play-Doh modeling compound for the whole family to shape and create. Lets you create just about anything you can imagine. • Play-Doh Play 'n Store Table -- All-in-one hands-on creativity table with easy storage. Fun half-mold shapes built into the table. Cut, press and fill with over 25 tools. • Play-Doh Kitchen Creations Magical Oven -- Load pretend food and Play-Doh compound, then press the lever. White light changes to red, oven makes a Ding! sound when done baking. Make pretend foods like: make-believe muffins, play pizzas, and crazy cakes. - Today is a good day for making homemade Guacamole Dip and share it with your friends and family. We all love guacamole parties so start planning that chip n' dip party.